Much of the work behind each flight begins several days before with the preparation of the flight plan. A list of all the sites we intend to visit is compiled and entered on Google Earth. The route for the flight is then uploaded into two Garmin GPS96C receivers that we will use to navigate on the flight. 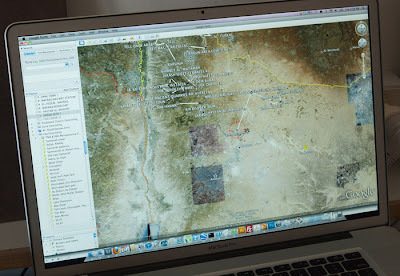 The APAAME team use Nikon cameras when photographing sites from the air. Usually the team have two Nikon D70s with 28-105mm Nikkor lenses and at least one Nikon D3 with a 24-70mm Nikkor lens on each flight. The preferred technique for aerial photography is to shoot in shutter priority mode with shutter speeds in the range of 1/500s to 1/1000s of a second. 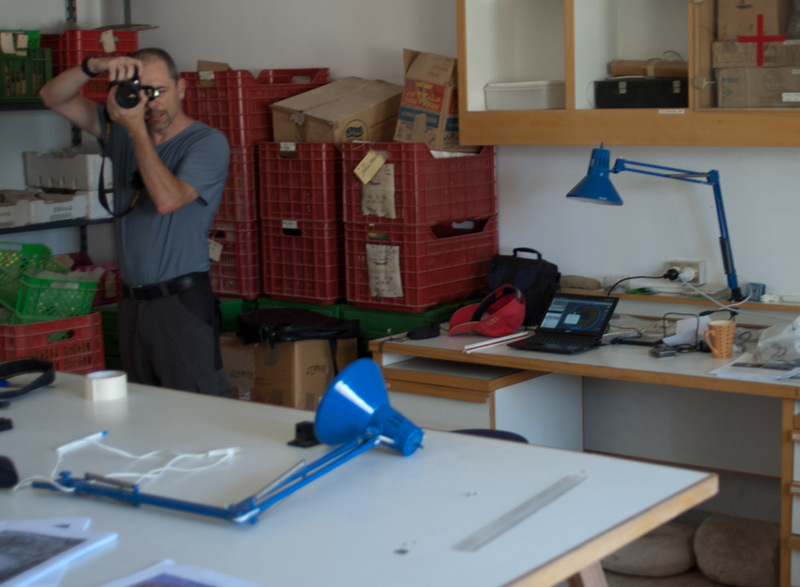 The photographs themselves are obviously of reduced value without their associated metadata (such as latitude and longitude), so a great deal of work is done post flight to ensure that the images are correctly tagged and cataloged. 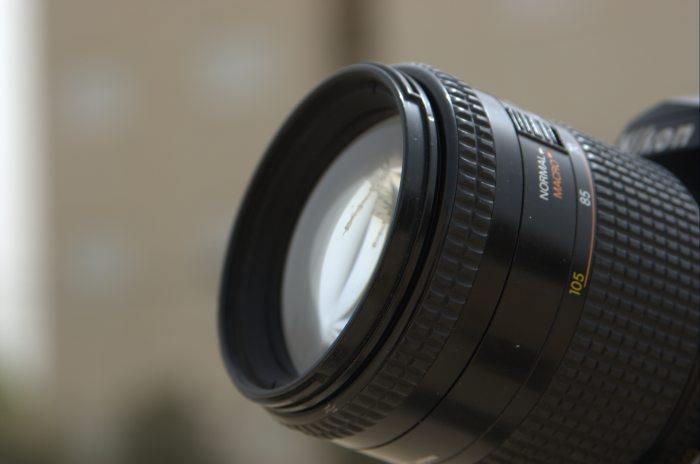 The D3s have GPS capability (using Geopic II), which is attached via the hot-shoe and cable. To geoencode the photographs taken by the D70s, we first record the time displayed by the GPS receivers by photographing them with each camera at the start of the flight. This allows us to correct the time data associated with each image to make it consistent and accurate. The GPS position of each photograph is then automatically added by matching the time of image capture to the position on the track log from the GPS receiver, using HoudahGeo software. Finally, the images are loaded into Adobe Lightroom 3 for any necessary corrective actions before being uploaded to Flickr. This morning the team made a short but glorious flight in a Bell UH-1H Iroquois from 8 Squadron, Royal Jordanian Air Force - crewed by Lt. Col. Husam and 2nd Lt. Salem. This particular aircraft - 809 - was acquired by the RJAF in 1995, before which it had a long and storied career with the US Army. 809 is a Model 205 long fuselage variant that was delivered from the factory in Fort Worth, Texas in 1970. 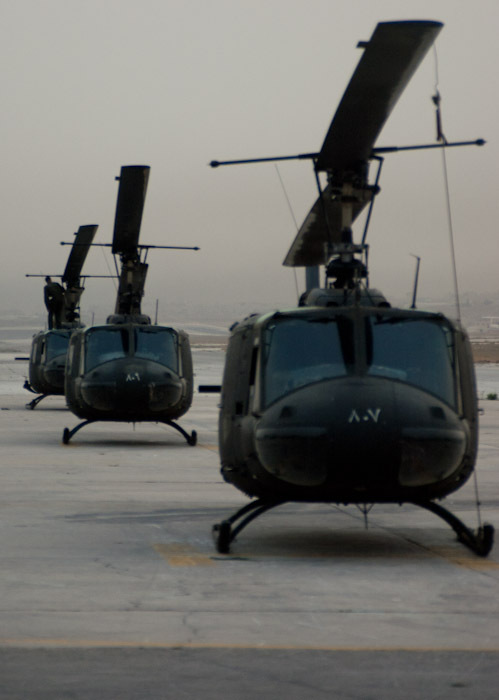 The aircraft bore the number 68-15284 in US service and is a Vietnam veteran, having seen action at Lai Khe in 1970-71 with the 227th Assault Helicopter Battalion of the 1st Cavalry Division (Airmobile). It also acquired striking artwork and the name of "Chickenman America" during its tour of duty. 809/284 is piece of flying history and we feel grateful to be able to experience it in the expert hands of the RJAF. down the rotors on our chopper (809) following the abortive take-off and landing. 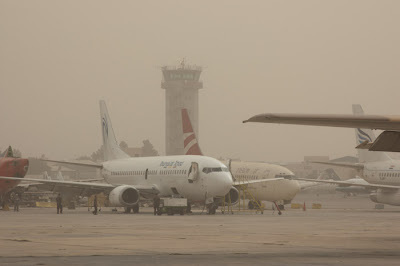 In an eloquent reminder of how best-laid archaeological plans can change overnight, our first flight of the year has been cut down to a 5 minute tour of Amman due to the sudden arrival of an unseasonably large cloud of dust from the Syrian desert. Having taken off in our UH-1 'Huey', the magnitude of the cloud soon became apparent, and our experienced pilot Lt. Colonel Husam returned to Marka immediately. Dust obscures the control tower at Marka air base. We are now back at base camp, eagerly watching the weather radars at http://oiswww.eumetsat.org/IPPS/html/MSG/RGB/DUST/EASTERNAFRICA/index.htm. 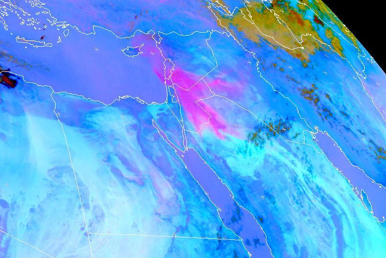 With any luck the worst of the dust will have moved west overnight, and we'll be able to fly our planned route tomorrow. The long wait for our next flying season is almost over. 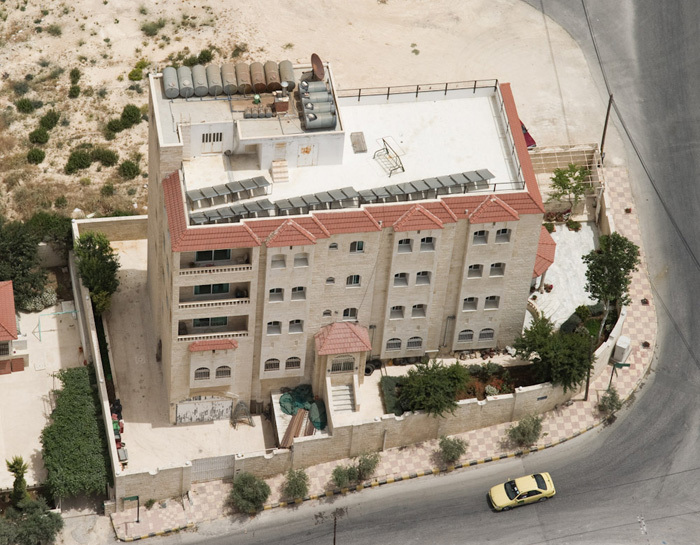 David, Simon and myself have arrived in Jordan and have pitched base camp in the laboratory of the British Institute in Amman. We set out for Marka Air Force Base at 5:30am tomorrow morning (most archaeological sites appear at their best in raking morning light), and will fly over more than 100 targets in the north-west corner of Jordan, photographing many of them from the air for the first time. David has sent me his list of target sites for this flight, some of which he has noted from academic articles and reports, and others that have been requested by researchers interested in specific aspects of Jordan's history. We are also revisiting several sites - including Jarash (ancient Gerasa) and Umm el Jimal ('The Mother of Camels' - a roman town) - that we have already photographed, to record new excavations and details the impact of continuing development that affects many sites in Jordan. All of these sites are put into an overall flight plan using MacGPS pro, and are then loaded into our two avionic GPS units, which allow us to navigate and direct the pilots to each site in turn. We generally fly in a circle over each site to allow us to photograph it from every angle. We aim to have the photographs up on our online archive as soon as possible (usually within a couple of days), so keep an eye out for these! Captive breeding programs have seen some species come back from the brink of extinction. The Environment Agency-Abu Dhabi has recently announced they are ready to release the Arabian Oryx, known locally as the 'Al Maha', back into the wild (link to ABC Environment Feature Article), and local nature reserves such as the Ajloun Forest Reserve have been acting to reintroduce other species such as Roe Deer which had become locally extinct in Jordan (see The Royal Society for the Conservation of Nature, Jordan, Website). 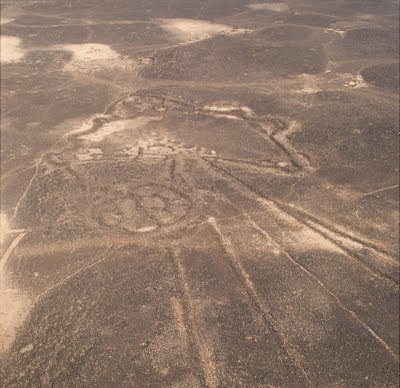 The stone structures known as Kites are believed to have been traditionally used for hunting these local ungulates (hoofed mammals) of Arabia, including gazelle, deer, oryx and onager, as well as ostrich. We know the wild population dwindled rapidly in the early 20th century due to human and environmental factors, such as hunting and reduction of natural habitat. Accessing the impact on the population caused by hunting using Kites is more difficult to access as no sites have been found directly linking Kites with the slaughter of these animals, but an excavation of a fourth millenium BC deposit of bones found in North-eastern Syria published in an article in PNAS may provide some insight into how hunting using Kites may have impacted the Persian Gazelle population in antiquity. 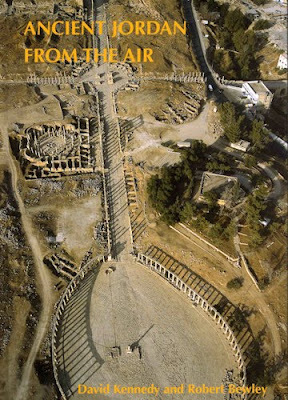 A wide range of photographs from our archive are now available in David Kennedy and Robert Bewley's Ancient Jordan from the Air, along with extensive background reading on the complex multi-layered history of Jordan and the many varieties of sites we find. The book is available from Oxbow books and Amazon. Outline of a group of wheels near the Azraq Oasis. This group consists of 38 separate wheels. This group of wheels is found along side a mud pan near the Azraq Oasis. It is one of four such large groups in the area. The group shows a huge amount of variation in style between individual wheels, some being merely walled enclosures, some having divisions, and some also including outer rings and cairns and/or hides. Some are much better preserved than others with walls crumbling from age as well as contact with the modern world, including bulldozed tracks through the site. A simple Wheel (Aritein Wheel 5) with nine spokes radiating from a central point and no hub. 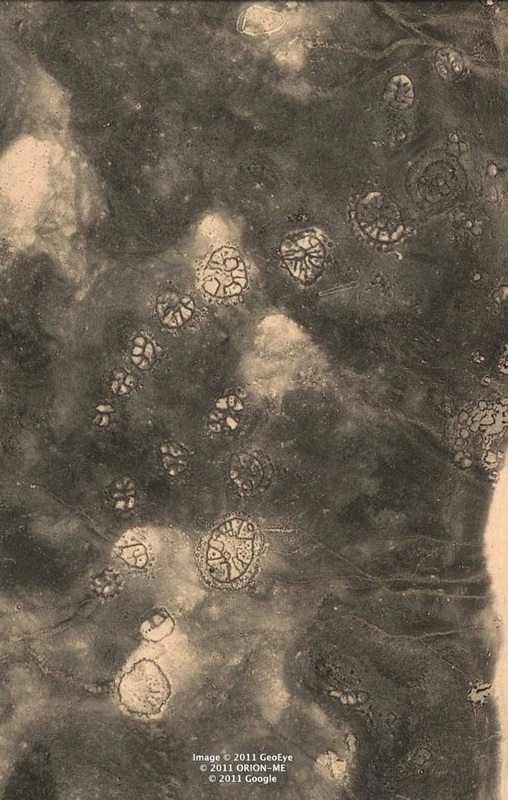 The Wheels of northeast Jordan are so-called due to their most common form, a circular structure with low stone walls, and lines radiating from a central point like spokes. Little is known of these sites beyond their type and location, as there has been little archaeological investigation.They were probably amongst the 'circles' mentioned by Rees in 1929. In the 1970s they were studied simultaneously by Helms and Betts (who called their examples 'Jellyfish') and Kennedy and Riley (who preferred 'Wheel (enclosure)'). 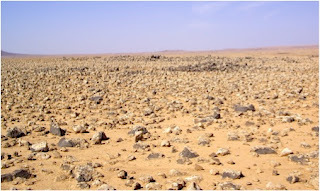 There are large numbers across the Harrat ash-Shaam of Jordan, and the numbers possibly exceed 1000. Aritein Wheel 2 seen from ground level. The crumbling low walls can be seen just before the horizon. Photo: Karen Henderson. The walls are very low on the Wheels, and are built without mortar or shaping of the stone. Although they are well known from aerial photographs and satellite imagery, the structures themselves can be easily missed in the landscape. Betts (1984: 29) notes that when surveying Wheels on the ground, they are so ephemeral as to go unnoticed if one does not already know they are there. 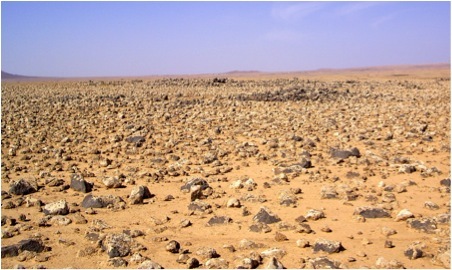 The above photograph shows the very slightly raised and darker rocks of a Wheel in the Aritein area, demonstrating how hard they can be to see on the ground. 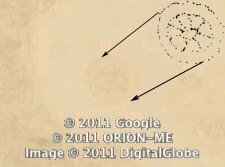 A plan drawn from a very faint Google Earth image of a singular Wheel found outside the basalt area. Wheels have large variations in size and type, but they seem to be almost entirely confined to the Harrat ash-Shaam. The only possible example found just outside of the basalt cover in the north of the panhandle is extremely faint and hard to identify. Despite its faintness, the structure appears to be of a coommon form – a large central open hub with straight spokes, and possibly an exterior wall or ring of Cairns around the outside. The mud pan that it sits on makes it very difficult to see, and it is possible there are other examples in the limestone steppe east and west of the basalt that have not been positively identified as yet. 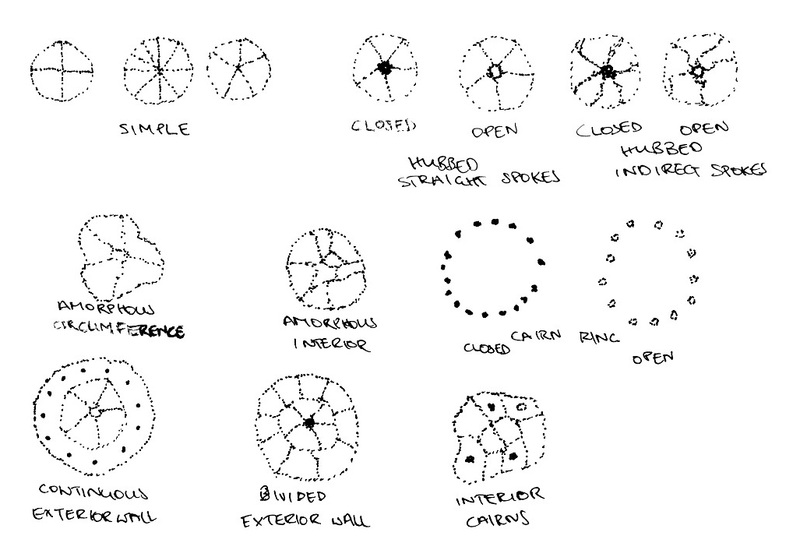 Wheel Typology. Drawn: Karen Henderson. 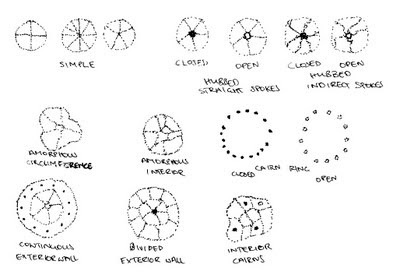 A Wheel typology (above) has been constructed for the basalt area of Jordan based on several defining features: the type or absence of a central hub; number and straightness of the dividing spokes or walls; presence or absence of Cairns within and/ or surrounding the main internal structure; shape of the main structure; and external wall features. Size is another defining factor. Each of the below features appear in many different combinations and configurations. So far, the types do not seem to have regional differences within the basalt, but there seems to a greater number of them in the southwest and central basalt. Azraq Wheel 15 overlying the tail of Azraq Kite 32. 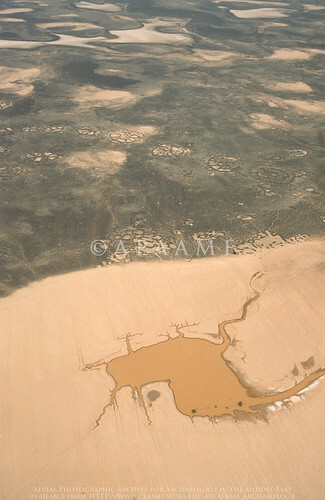 APAAME_19970527_DLK-0153. Generally, the structures are built on slopes or hills, although unlike Cairns and Pendants, they are not usually on highly visible ridgelines. They are often found on or near the Kites, either overlying the tails, or built within a Kite head, and it is this which suggests a later date for Wheels than Kites. They are also often grouped together, particularly in areas with a heavier basalt cover, like Azraq, Safawi and Aritein. 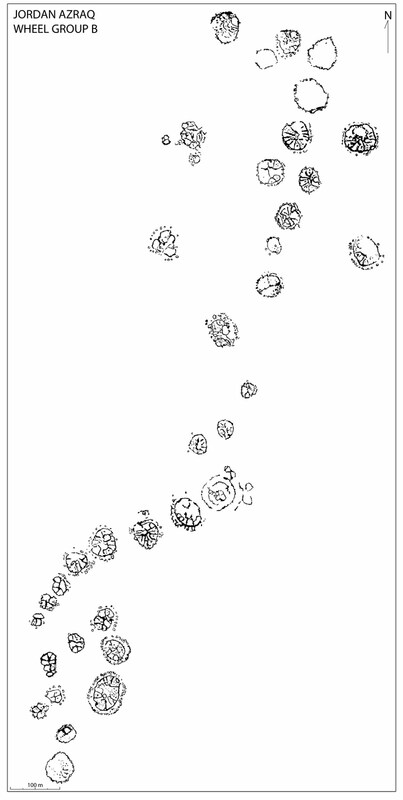 There does not seem to be a particular pattern to their type when grouped in such a way, as there is large variations in size and shaped, as well as defining features across the clusters. 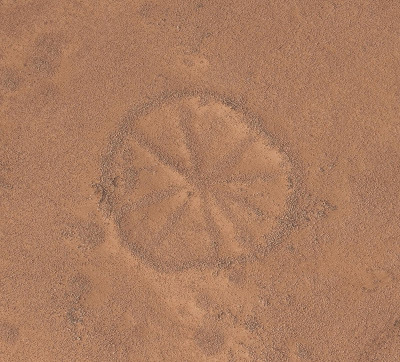 A large variety of Wheels grouped together near the Azraq Oasis, where these kind of groups appear to be most common. Image: Google Earth. There is no stratified archaeological evidence available for these structures, and what little there is was collected during archaeological surveys focused on other sites or structures in the 1980s. The related Wheel structures within these survey areas were commented on but little information was collected, as they were not the focus of the investigation. Still, both Helms (1981: 50) and Betts (1982: 186) attribute a Neolithic date based on artefact assemblages. Helms does not give details, merely saying that recognizable Neolithic implements (7th-5th millennium) were found within the Wheels. One point here, however is that it is sometimes difficult to distinguish his comments in relation to the Wheels with those pertaining to the ubiquitous corrals, a different site type entirely. Betts devoted a paper to the structures she refers to as ‘Jellyfish’, and it is these sites which are referred to in Helms’ earlier work (above). She notes the propensity of these sites to be built on the higher plateaus and slopes of basalt, and also the relationship to the Kite sites. Like Helms, she suggests a habitation function for the Wheels. However, neither of them argue this convincingly, since most of their assumptions are based on placement and structure. Betts notes that they are often placed on higher ground above water sources in areas that are more difficult to build on. She suggests this is to provide protection from ‘belligerent peoples’, but it makes little sense to build an enclosure for sleeping and protecting your animals in a place that is away from water, and hard to access. In short, there is very little known of the Wheels in relation to their function and age. However, much more evidence is emerging in relation to their placement, size and type, and these features may allow a better understanding, and perhaps allow for more reasonable suggestions of function. * Helms, S. (1981) Jawa. Lost City of the Black Desert. Methuen, London. * Rees, L.W.B. (1929) 'The Transjordan Desert', Antiquity 3: 389-406. * Riley, D.N. (1982) 'Antiquities recorded by old photographs taken by the Royal Air Force of the desert near Azraq Duruz', in Kennedy, D.L. (1982) Archaeological Explorations on the Roman Frontier in North-east Jordan, Oxford (BAR, Int. Series 134): 345-355. Keep an eye out for some new ways of viewing our archive in the near future.